Cute denizens of the dirtier parts of the forest floor interact with each other and talk about everything from God to Facebook in this latest outing from Kochalka, printed under the Retrofit Comics banner. Fooling around with characters Kochalka created for a video game, this comic is more of an experiment than anything else. Kochalka himself isn't sure if there will be any further stories, noting that it's a "feverish experiment." 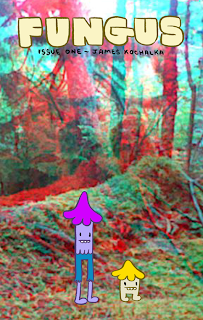 Instead of using his standard personal avatar, two mushrooms form the backbone of the lead story, while two piles of moss are the protagonists of the second outing in the comic. The shrooms re-appear for a one-page, back cover joke relating to the second story. If you are only familiar with Kochalka's work from his most recent comics that area geared for children (Dragon Puncher and Johnny Boo), this book might come as a bit of a shock to your system. Instead of cute adventures that relate to the wonders of the world, this is back to the more adult, darker territory where Kochalka debates the meaning of life. The philosophy of his books is consistent--the world is a great place, if you know how to look at it--but that view is questioned here, though it ultimately wins in the end. A small fungus takes Kochalka's views, pointing out that God must love ugliness, because it is all around us and that a party is what you make of it. The taller shroom is doubtful of this, pointing out some holes in the argument. But as we can see, thinking positively leads to good results. Despite the darker tone, the ultimate spirit is the same in this as in, say, Dragon Puncher. The second story is mostly just Kochalka fooling around with sight gags and puns. Two heaps of moss claim to invent Facebook, and are insulted by having a book with a portrait on the cover thrown at them. They discuss the wonders of Facebook with an unimpressed shroom (who would rather commune with God on his phone), who probably is standing in for Kochalka's view of social media. It's a funny little story with multiple punchlines that shows sometimes Kochalka is content to just be a bit on the weird side. I think this book works best for long-time fans of Kochalka who already know where he's coming from. Given that it's coming out via Retrofit Comics, a small imprint run by indie comics guy Box Brown, rather than, say, Top Shelf, leads me to think the intended audience are those of us who are fans of the Elf. I think you'd be better off reading Kochalka's non-kids Top Shelf work before picking this one up. However, if you already are familiar with Kochalka, this is a nice addition to your collection of his comics on your shelf. I would be remiss if I didn't mention that Fungus Issue 1 is the start of an entire series of mini-comics by independent creators, spearheaded by Brown. Future contributors include Liz Baille, Noah Van Sciver, and Colleen Frakes, all of whom will be at SPX this year. Brown's goal is to bring more floppy indie comics into the world, and this was a great start to that goal. I'm definitely looking forward to more! I do not know if Kochalka will be bringing copies of Fungus to SPX. However, if you are not going to be at the show or want to make sure you can get a copy of Fungus while it is available, you can buy it at the Retrofit store here.